In honor of what Wallace Gilberry did for the Bengals against the Browns last week I decided to write an article on the 5 teams who should just pack it in the last 2 weeks of the regular season and refocus on next season because they have insufficient funds. Browns are now going with Johnny Football. unique situation. If you would have asked the average football fan how many wins Cleveland would have at the end of the year, I don’t think to many of them would have said 7. But, they have 7 wins with 2 games yet to play! The last 2 games for them should be the Manziel experiment. The Browns should count this season as a win overall and see what they got going for next year. They are in the best division in football, and they are currently at .500. But there is no way they are going to leap frog the Bengals, Ravens, and Steelers for a play-off spot.I said it in an earlier article, when arguably your 2 best athletes are suspended (Gordon) and your back-up quarterback, it is hard to evaluate where you are and where you need to be. Their investments are growing, they just don’t have enough of a return yet. 2) Chicago Bears- So, you fired a well known popular head coach to bring in a head coach no one had ever heard of. Then you sign a quarterback with questionable character issues to a long term big money contract. Then you let your most popular player of the last 10 years go (Brian Urlacher), with out a proper send-off. Your not still wondering why you are on this list are you? 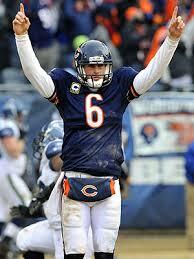 Bears starting quarterback Jay Cutler. The Chicago Bears need to trade every possible player they can that they can get draft picks for, and go into a full rebuild mode. Yes, that means Forte, and Marshall, and again anyone else. You are in a division with Green Bay, and a Detroit team that seems to finally have their act together and an up and coming Vikings team that is improving. Please do not do the try to rebuild around our veterans thing. You have insufficient funds, don’t stay at that bank and keep bouncing checks for the next 3 years and cost yourself more money. Switch banks and start investing for the future. Redskins Head Coach Jay Gruden. 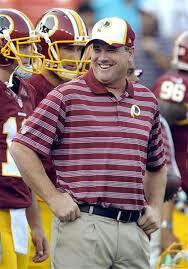 3) Washington Redskins- This team is a mess, and it is all because of 1 man. The owner Daniel Snyder. Until he stops trying to manage a team with a checkbook and just stays out of the day to day operations, they will continue to be a mess. You have a brand new head coach, and he sounds like he wants out before he even completes his first full year. 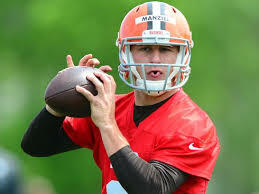 You are being made fun of at coin tosses, on your own field (if you do not know the reference read this article I published on this site a few weeks ago http://cleatgeeks.com/?p=1361) You have 3 quarterbacks and none of them can stay on the field, and the list goes on and on. But, until Daniel Snyder hires someone to run the team with his money instead of him trying to run the team with his money the Redskins will only do rain dances every year. 4) Kansas City Chiefs- Yes, the Chiefs. And before you start sending me nasty comments below, hear me out. 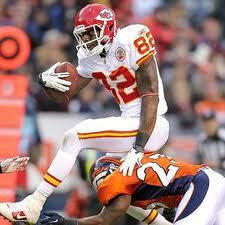 Chiefs star receiver Dwayne Bowe. The Chiefs have an identity crisis, they know who they want to be, but they are afraid to be that team. And I say, just embrace being boring and win. Yes, being boring. The Chiefs want to play field position, and run the ball down the opponents throat. But, that is boring. It is why the 49ers let Alex Smith go. He is an accurate quarterback, as long as he throws passes under 25 yards and preferably under 15 yards. They do not stretch the field, they do not do any trick plays, they simply run the ball and throw passes that usually are so short that they need to complete two of them to get a first down. So, they need to embrace who they are. That starts with trading Dwayne Bowe. The Chiefs want to use him to stretch the field, but currently the rest of their offense is not equip to follow. They need to trade him to a team who is willing to give them a 2nd and a 4th round pick so that then they can go get a couple of Andrew Hawkins’ type slot receivers or possibly 2 big blocking tight ends who can also catch. The latter would help them both in their run game and their short passing game. Your fans will be fine with boring as long as you are winning and making the play-offs, but right now, you are a day late and a dollar short. The coach and the Quarterback. 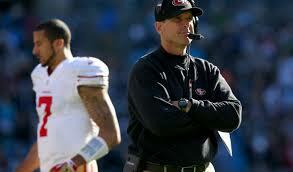 5) San Francisco 49ers- OMG this team is in shambles. They made the wrong choice at quarterback because they wanted to be flashy and have the run option. They do not know who their coach is going to be next season, and he seems to be out even before this season even ends. They have a new stadium, but everyone seems to hate it. Or, at least it has gotten quite a few bad reviews that I have read. There team is aging very quickly, as of the beginning of this year, they are the 22nd oldest out of the 32 teams. And like the Browns above they are in a tough division with the Rams improving and getting ready to pass them. This is sopose to be a storied franchise, and they are running out of gold right before our very eyes. In my opinion they need to follow the model I set forth for the Chicago Bears. But, they should be more successful at it, because they have more desirable pieces to clubs who are close to the play-offs but just need a little nudge. They have some above average players but most of them are in the down years of their careers. And they need to decide what they are going to do at quarterback. But before that they need to figure who their coach is going to be. All the terms on their investments are coming due, and they nedd to decide weither to reinvest or cash them in before they have insufficient funds. Next Story → How Old is Your NFL Team?